Kalmykia is one of the three Buddhist republics in Russia—the other two are Buryatia and Tuva. The populations of the three republics follow Tibetan Buddhism and regard His Holiness the Dalai Lama as their foremost spiritual leader. Between 1991 and 1992, the Dalai Lama visited Kalmykia, Buryatia, and Tuva during a period of a great transition in Russia. On 26 December 1991, the Soviet Union collapsed, granting self-governing independence to what before then were socialist republics of the Soviet Union, creating the Commonwealth of Independent States (CIS). Buryatia, Kalmykia, and Tuva remained autonomous republics in 1992, but within the new Russian Federation. The Dalai Lama’s most recent visit to the region was in 2004. Russia has rejected his visa requests at least three times since 1992, but in 2004, a visa was granted on the grounds that the Tibetan spiritual leader limit his activities to pastoral purposes. Since then, the Russian government has turned down all of the Dalai Lama’s subsequent visa applications. During these years, the head of the Republic of Kalmykia* was Kirsan Ilyumzhinov (from 1993–2010), a famous Kalmyk businessman and politician, who is currently president of FIDE (Fédération Internationale des Échecs), the World Chess Federation. In 2008, the Dalai Lama visited the Kalmyk Buddhist Temple in the Feltonville neighborhood of North Philadelphia, in the United States. The temple is managed by the Kalmyk Brotherhood Society of Philadelphia, an organization founded by Kalmyks living in the Philadelphia area, whose main goal is supporting Kalmyk religion, culture, and traditions. Philadelphia is also the birthplace of Telo Tulku Rinpoche, one of the main figures responsible for the revival of Buddhism in Russia, whose family were immigrants of Kalmyk origin. Among his numerous noble activities was the construction of the largest Buddhist temple in Russia and Europe—the Golden Abode of Shakyamuni Buddha in Elista, Kalmykia— with the support of Kirsan Ilyumzhinov. Telo Tulku Rinpoche joined the Dalai Lama during his visit to Kalmykia in 1992. Upon arrival, the Dalai Lama appointed him as the shadjin lama (head lama) of the Kalmyk people, making him responsible for the Buddhist revival among the Kalmyks. In 2014, he became the honorary representative of the Dalai Lama for Russia, Mongolia, and members of the Commonwealth of Independent States. The Golden Abode of Shakyamuni Buddha was founded in December 2005, a year after the Dalai Lama’s visit. His Holiness blessed the site of the temple and gave it its name. Since then, the Kalmyk people have lived with great hope that the Tibetan spiritual leader will return to Elista and bless the completed temple. For the past 18 years, Telo Tulku Rinpoche and the former head of Kalmykia, Kirsan Ilyumzhinov, have strived to make this dream come true. Two formal invitations were sent to the Dalai Lama by the shadjin lama and the FIDE president. In May 2012, both of them visited the Tibetan leader’s residence in Dharamsala, India, to discuss the development of Buddhism in the Russian Federation. During the meeting, the Dalai Lama expressed a wish to visit the three Buddhist republics, in addition to Saint Petersburg and Moscow, but only if the visit would not inconvenience the Russian government. Telo Tulku Rinpoche and Kirsan Ilyumzhinov returned to visit His Holiness in Dharamsala in August 2018. 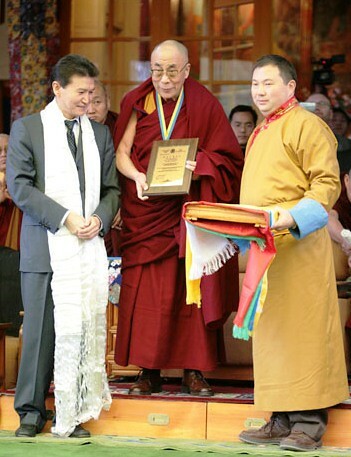 During their meeting, Ilyumzhinov requested that the Dalai Lama visit Kalmykia to consecrate the central khurul (temple) the Golden Abode of Shakyamuni Buddha. Ilyumzhinov stressed that the ritual of consecration of the temple would be an outstanding event in the spiritual life of Kalmyks. The Dalai Lama said that he was praying for the opportunity to visit Kalmykia and conveyed his wish that the Golden Abode of Shakyamuni Buddha become a place of Buddhist pilgrimage. He also noted that the Russian Federation is one of the leading nations in the world in the revival of the ancient Buddhist traditions of Tibet and Russia, which is very important for spiritual reasons. He added that Tibet and Russia have maintained a very special relationship over the centuries. Also during the meeting, Ilyumzhinov presented the Russian-Indian co-production of the film The Buddha to the Dalai Lama, and received his approval and blessings for a project to present the life of Shakyamuni Buddha as a film. In 2016, a similar visual art project was released in Kalmykia—the musical performance I Am Buddha, which was presented in Moscow in the same year, and two years later in Tuva and Buryatia. During his visit to Dharamsala, the former Kalmyk head also met Venerable Thupten Ngodrup, the medium of Tibet’s chief state oracle, who expressed certainty that the Dalai Lama would visit Russia again. Ven. Thupten Ngodrup visited Kalmykia in 1997, 1999, and 2001, with the first two visits organized by Ilyumzhinov. News of Ilyumzhinov’s invitation to the Dalai Lama quickly spread in Russian media and resurrected the hope of many Kalmyks and Russians that their beloved teacher would one day return. * According to the Constitution of the Republic of Kalmykia, the country is governed by the head of the republic, who is selected by the president of Russia.